He started his career on TV as an actor in 1999, on the Rede Globo's show Sandy e Júnior. In 2000, he went to work on MTV Brasil, hosting the shows Supernova and Piores Clipes do Mundo (Worst Videos in the World, in Portuguese). With the success of the latter, Mion was hired by Rede Bandeirantes in 2002, where he hosted the show Descontrole, known for a lot of live improvisation. 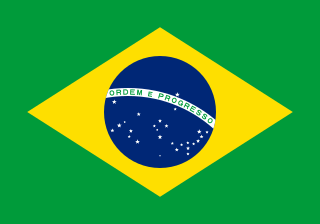 Brazilian Portuguese is a set of dialects of the Portuguese language used mostly in Brazil. It is spoken by virtually all of the 200 million inhabitants of Brazil and spoken widely across the Brazilian diaspora, today consisting of about two million Brazilians who have emigrated to other countries. He later returned to MTV Brasil, hosting the shows Covernation, The Nadas, Mucho Macho, Descarga MTV, and Quinta Categoria. Mion is a devout Roman Catholic christian. Caio Blat de Oliveira is a Brazilian actor. Luana Elídia Afonso Piovani is a Brazilian actress and former model. Adriane Kelemen Galisteu Iódice is a Brazilian actress, TV host and former model. Bianca de Carvalho e Silva Rinaldi is a Brazilian actress. She is best known for her roles in telenovelas, especially A Escrava Isaura. Luís Lázaro Sacramento Ramos is a Brazilian actor and voice actor. He started his acting career with the Flock of Olodum Theater group, in Salvador, and is best known for his portrayal of João Francisco dos Santos in the 2002 film Madame Satã (film). Lázaro is married to Brazilian actress Taís Araújo. In 2007, he was nominated for the 35th International Emmy Awards for Best Actor for his role in Cobras & Lagartos. Giovanna Antonelli Prado is a Brazilian actress, television host and producer. Fernanda Arrias Machado is a Brazilian actress. She is best known for her role as Maria in the film Tropa de Elite. Monique de Araújo Alfradique is a Brazilian actress. Dalton Vigh de Sousa Vales is a Brazilian actor. André Ricardo Bankoff is a Brazilian actor. Pânico na Band was a Brazilian comedy television show broadcast originally by the Band network from April 1, 2012 until December 31, 2017, produced in a partnership between Band and Jovem Pan, the latter being the owner of the show's format. This is the second television version of the radio show Pânico, succeeding Pânico na TV, which was broadcast by RedeTV! between 2003 and 2011. Nathália Cataldo Rodrigues is a Brazilian actress. Patrícia França Monteiro de Oliveira is a Brazilian actress. Herson Capri Freire is a Brazilian actor. The first episode of the Brazilian situation comedy Tá no Ar premiered on the Globo Network on Thursday night, April 10, 2014. It was written by series creators Marcelo Adnet and Marcius Melhem, and directed by Maurício Farias. Marco Fábio Maldonado Pigossi is a Brazilian actor. He is known for playing Dylan on the Australian television series Tidelands. Bruno Carvalho Fagundes is a Brazilian actor. Mylla Christie Vitta Sartori is a Brazilian actress, model, singer, television presenter and businesswoman. Patrícia Renaux Chamagne de Sabrit, better known as Patrícia de Sabrit, is a Brazilian actress and television presenter. ↑ "João Gordo vai entrevistar políticos em novo programa da Record". Terra.com.br. Retrieved 3 December 2009. ↑ "Blogs". R7. Retrieved 12 June 2010. ↑ "Mion revela que não gosta da fama e quer voltar a atuar". Terra.com.br. Retrieved 12 April 2002. ↑ Daniel Castro (18 May 2012). "Marcos Mion apresenta Ídolos; Rodrigo Faro terá programa diário". R7. Retrieved 19 May 2012. ↑ http://www.r7.com, R7-. "Marcos Mion". Marcos Mion (in Portuguese). Retrieved 2019-02-21. ↑ Redação da Terra (20 January 2004). "Marcos Mion confirma volta para a televisão". Terra.com.br. Retrieved 26 March 2015. ↑ Bruno Motta (November 11, 2009). "MTV investe no humor". UOL . Retrieved 26 March 2015. ↑ "Marcos Mion: 'Já usei drogas na minha adolescência'". Virgula (in Portuguese). Retrieved 2019-02-21. ↑ "Perfil de Marcos Mion no IG". IG.com.br. Retrieved 26 March 2015. ↑ "Marcos Mion comemora 10 anos de casado e reúne famosos em São Paulo". Yahoo! Celebridades. Retrieved 26 March 2015. ↑ Mion, Marcos (2016). "A escova de dentes azul". livrariacultura.com.br/. Livraria Cultura. Retrieved 2019-04-19. ↑ Mion, Marcos (2016). "A escova de dentes azul". autismoerealidade.org.br/. Autismo e Realidade. Retrieved 2019-04-19. This Brazilian biographical article related to television is a stub. You can help Wikipedia by expanding it.